The Pentagon tonight apologised after shocking new details emerged of how American soldiers formed a 'death squad' to randomly murder Afghan civilians and mutilate their corpses. An investigation by Rolling Stone magazine details how senior officers failed to stop troops killing Afghans and keeping their body parts as trophies. In one horrific episode, the magazine claims troops threw a grenade at an innocent Afghan boy before chopped off his finger and later using it as 'gambling chip' in a game of cards. The disturbing detail included in the dossier accuses American troops of a new level of depravity and is likely to be a public relations disaster for the military. The U.S. Army says the photos of American soldiers posing with dead Afghans are 'in striking contrast' to its standards and values - apologising for any distress caused by the images. A video showed two Afghans on a motorcycle being gunned down. The magazine claims the men hacked off bits of skull from their victims and kept them as trophies of their kills. The soldiers are also accused of opening fire on civilians for no reason and covering up their attacks by planting guns and magazine on their victims. The magazine claims that amongst the accused 'killing innocent Afghan civilians became less a reason for concern than a cause for celebration’. 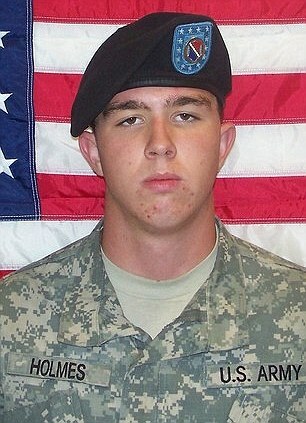 Last week Army Specialist Jeremy Morlock, 23, admitted his part in the twisted scheme and was jailed for 24 years. The remaining four soldiers who are due to be court-martialled are Sergeant Calvin Gibbs - who is accused of being the ringleader - Specialist Adam C. Winfield, Specialist Michael S. Wagnon II and Private first class Andrew H. Holmes. They were all part of the 5th Stryker Combat Brigade, of the 2nd Infantry Division, who carried out at least four executions in Kandahar province between January and May last year. 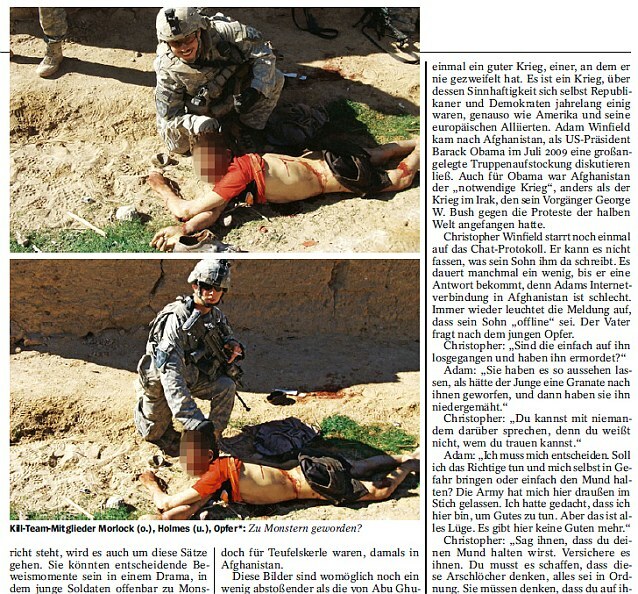 The Rolling Stone article describes in lurid detail how American troops allegedly killed an Afghan boy before mutilating his corpse. 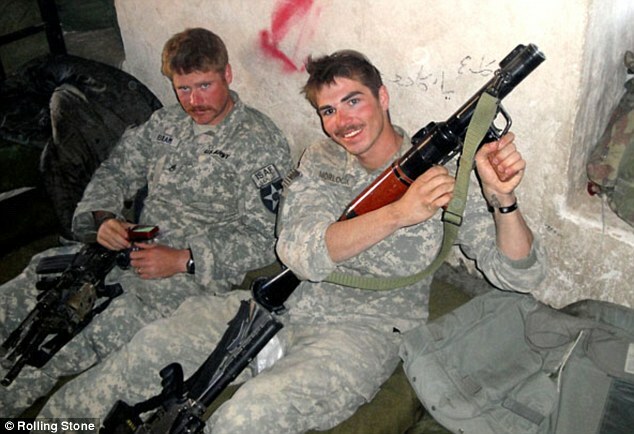 Soldiers Jeremy Morlock and Andrew Holmes had spotted a young farmer working by himself on January 15 2010 in the Afghan village of La Mohammed Kalay. Gul Mudin, 15 - only four years younger than Holmes - was the only Afghan in sight, had no weapons on him and had a ‘welcoming’ face. Nobody else was around. Gul walked towards them when called and stopped when asked. 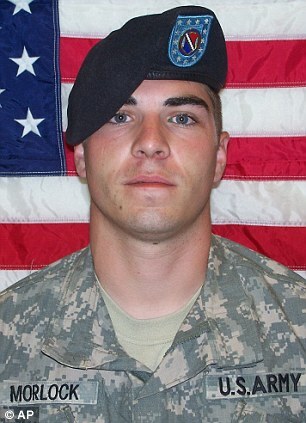 Morlock tossed a grenade at him, using the wall as cover, then both soldiers opened fire. Gul fell face down into the ground and there was soon a pool of blood coming out from his head. 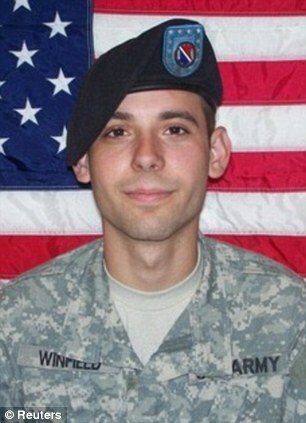 Winfield told his fellow soldier Ashton Moore that it was more likely a staged killing. Morlock and Holmes told a sergeant that Gul had been about to attack them with a grenade and they therefore had to shoot him, reported the magazine. 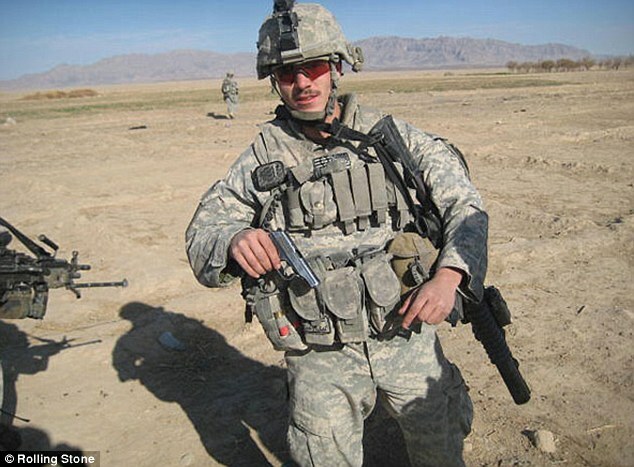 The story of a lone Taliban fighter, with one grenade attempting to ambush a platoon in broad daylight, seemed unlikely to top officer Captain Patrick Mitchell. 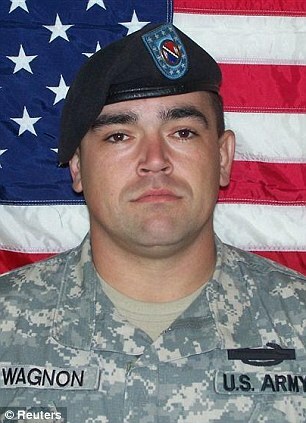 But he told Staff Sergeant Kris Sprague to ‘make sure’ Gul was dead. Sprague fired his rifle twice at the boy. A local elder working nearby in the poppy fields came over and accused Morlock and Holmes, below, of murder, but he was ignored by the soldiers. This elder was asked to identify the boy, but it tragically turned out that he was his dad. ‘The father was very upset,’ an official Army report noted. The soldiers followed Army protocol of cutting off the dead boy’s clothes and stripping him naked to check for tattoos, before scanning his iris and fingerprints. But then they began taking photographs of them celebrating the kill, with Holmes posing for the camera by grabbing Gul’s head by the hair as if he was a deer. Staff Sergeant Calvin Gibbs then started ‘messing around with the kid’, moving his arms and mouth like a puppet, before slicing off the dead boy's finger and giving it to Holmes. A few hours after the killing, Holmes and Morlock were playing cards and said they would bet a finger in a game of spades, before tossing Gul’s onto the pile. Medic Alyssa Reilly told investigators: ‘It was gross’. According to Rolling Stone the men joked for weeks about killing ‘savages’ before finally murdering a boy of around 15 in a farming village, their first kill. To cover their tracks they threw a grenade in his direction to make it look like they had come under attack. But with his body on the floor events took an even more sinister turn as Gibbs allegedly started ‘messing around with the kid', moving his arms and mouth and ‘acting like the kid was talking'. He then supposedly took a pair of medic’s scissors and snipped off the boy’s pinky finger and handed it to Holmes as a trophy for his first kill in Afghanistan. Rolling Stone claims Holmes carried it around in a zip-lock bag. Later that night Morlock and Holmes were playing a game of cards and, when it came time for their wager, they supposedly said they would bet the finger. A female medic who was watching walked away in disgust. In a separate incident in November 2009, Gibbs began playing with a pair of scissors near the hands of a dead insurgent killed by a helicopter, after the body was stabbed with a knife by another solider. 'I wonder if these (scissors) can cut off a finger?' Gibbs asked. 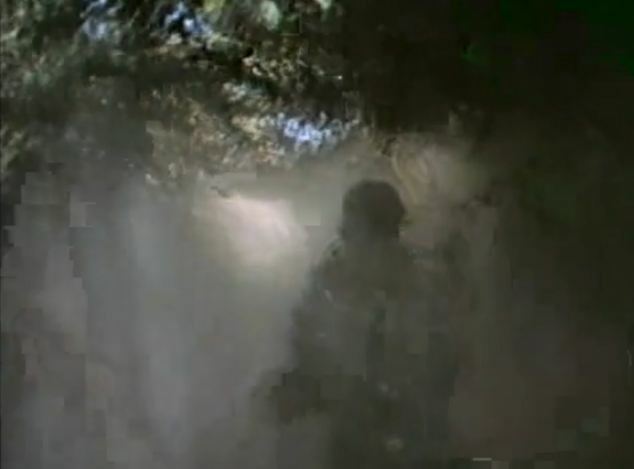 In another incident on a night in January 2010 the platoon was driving near their forward operating base and spotted a human heat signature on the roadside through their thermal imaging equipment. Soldiers stopped nearby and went up to the man, who held his arms in front of his chest – which meant to them that he was either cold or hiding a suicide bomb vest. 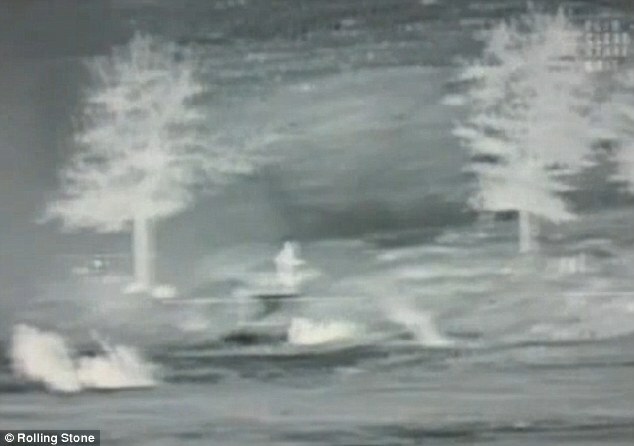 He paced back and forth, ignoring their calls, and was ‘acting strange’ as the soliders fired warning shots around him. He then started walking towards them. Someone yelled ‘fire’ and the soldiers shot around 40 rounds in a few seconds. The man turned out to be unarmed and either deaf or mentally disabled, according to official statements. Soldier Michael Wagnon collected a piece of the skull and kept it as a trophy, but commanding officer Captain Matthew Quiggle ‘strongly believed’ they had illegitimately killed a local national. The platoon then tried to cover up the shooting by pretending to find a weapon – which was actually a black AK-47 magazine that had been stowed in a metal box by Sergeant Calvin Gibbs. However the U.S. military still considers the man responsible for his own death because he ignored the platoon’s warnings and moved in their direction. The article by Rolling Stone is the latest in a series of damaging exposés by the magazine of the conduct of U.S. troops in Afghanistan. Barack Obama fired his top Afghanistan war commander Stanley McChrystal and replaced him with his boss and mentor, David Petraeus, in June 2010, following a Rolling Stone interview. General McChrystal criticised administration officials, the U.S. President and his advisers in the article. President Obama claimed General McChrystal's comments were not the reason for his firing - but said his team needed to unite in pressing the war effort. Mark Boal, the author of the latest Rolling Stone piece, is a well-known journalist, screenwriter and producer. He won Oscars for his work on The Hurt Locker in 2008, labelled as the 'most insightful Iraq film yet'. The Rolling Stone article talks in detail about how the soldiers felt invincible and emboldened by the lack of policing by their superiors. It also details a serious of disturbing videos and pictures of the victims taken by the men - one shows a hand with a missing finger, another depicts a severed head on a stick and others show blown up legs. 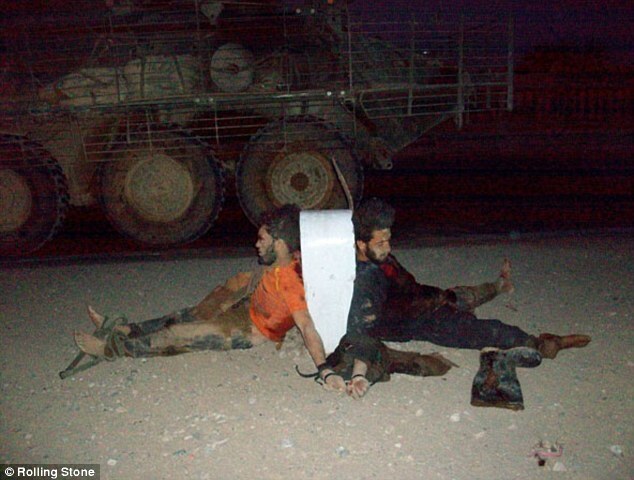 In two cases soldiers pose over the bodies of their victims as if they are hunting trophies. The men also made videos including one which was filmed on Sept 12, 2009. 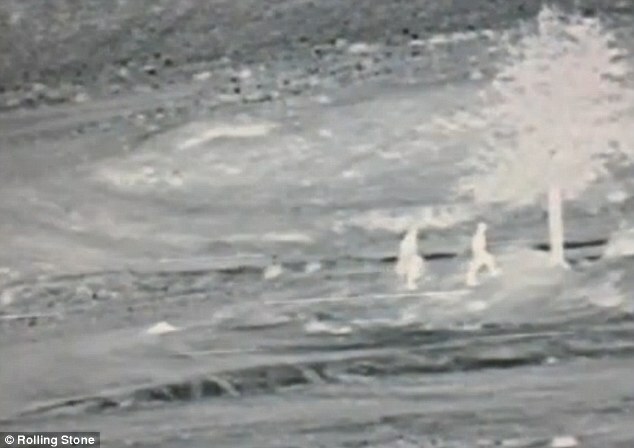 It shows infra-red camera footage of two Afghans putting what could have been an improvised explosive device in the ground ahead of the soldiers. Regardless of whether or not it is an IED, filming at such a time is a clear breach of Army rules. They also edited it down, added a soundtrack and gave it a chilling name - ‘Death Zone’. In a further breach of regulations the soldiers videoed themselves in combat in Afghanistan and passed around the footage to each other on USB sticks. Rolling Stone has for the first time published the videos which were supposedly passed around by the men of 5th Stryker Combat Brigade as they carried out their executions in Kandahar province. In the first clip the men can clearly be heard joking: ‘They’re going to f****** die’ and ‘You don’t f*** with us’. As the airstrike starts so does the song ‘En Vie’ by Apocalyptica, a cello rock band from Helsinki. A title card called ‘Aftermath’ comes on screen followed by close-up colour images of the men’s bloodied bodies with horrific close-ups on their injuries. The credits then roll explaining how ‘Shadow PLT’ was behind the picture and that a Sergeant Michael Schweitzer did the editing. According to Rolling Stone the men would pass the gruesome videos around on USB sticks and hard drives. They would file them on their personal computers alongside clips of TV shows, Ultimate Fighting fights and films such as Iron Man 2. 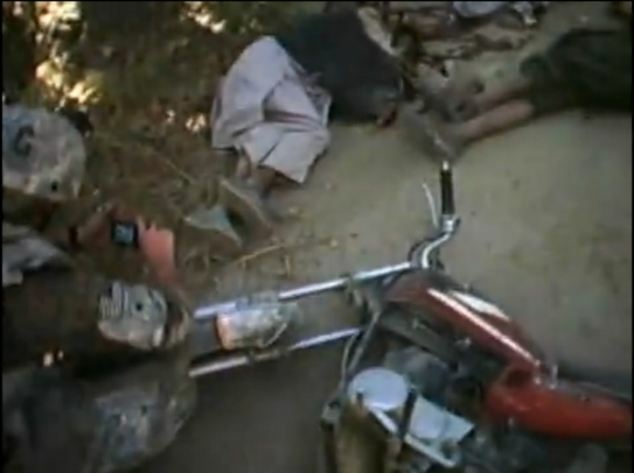 A second video released by the magazine shows a separate incident in which two Afghans on a motorcycle are gunned down. Although not apparently as disturbing as the first, it nonetheless shows a total disregard for combat rules. ‘Even if the killings were part of a legitimate combat engagement it is a clear violation of Army standards to share such footage,’ Rolling Stone says. The U.S. Army has been keen to paint the men involved as if they were working alone but the article claims that internal records show the ‘Kill team’ was ‘operating out in the open, in ‘plain view of the rest of the company’. ‘Far from being clandestine, as the Pentagon has implied, the murders of civilians were common knowledge among the unit and understood to be illegal by "pretty much the whole platoon",' it says. The revelations have been a PR disaster for the U.S. Army and is the most serious prosecution of alleged U.S. military atrocities during 10 years of war in Afghanistan. The existence of the photos and videos, among dozens seized as evidence by investigators and ordered sealed from public view by the Army, has drawn comparisons with pictures of Iraqi prisoners taken by U.S. military personnel at the Abu Ghraib prison in Iraq in 2004. The Pentagon desperately tried to suppress the photos, with General Stanley McChrystal and President Hamid Karzai briefed on the photos as early as last May. 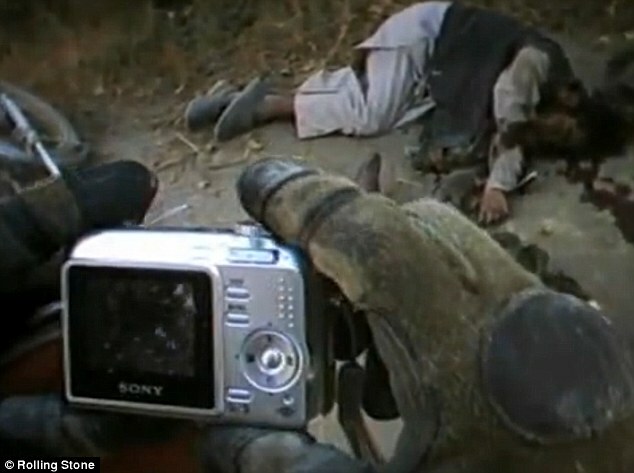 The military attempted to pull the pictures out of circulation to avoid a scandal similar to Abu Ghraib, so investigators in Afghanistan confiscated computers and told soldiers to delete provocative images. The Army Criminal Investigation Command meanwhile toured the U.S. to the homes of soldiers and their relatives to gather as many copies of the files as possible. The remaining four soldiers who are due to be court-martialed are Sergeant Calvin Gibbs - who is accused of being the ringleader - Specialist Adam C. Winfield, Specialist Michael S. Wagnon II and Private first class Andrew H. Holmes. Seven other members of the combat unit were charged with lesser crimes during the investigation, which grew out of a probe into hashish abuse by American GIs. Four of those men already have pleaded guilty and been sentenced.